Before a crowd of 300 AFC Kempston Town & Bedford College became the 39th club to engrave their name on the Britannia Cup when a goal from Ryan Smith eight minutes into the second period took them to a 1-0 victory over Wilstead -losing their second consecutive final. The pre-match opinion of who were the favourites to lift the cup was as divided as the forthcoming general election. Was it Great Barford, currently sitting one place above the Albion in the league standings and recent Bedfordshire FA Intermediate Cup beaten finalists or the Albion, who despite taking four of the six points from Great Barford in their league encounters this season coming into the game having only won one of their last 10 league outings. Only one thing was known for sure, it was going to be close encounter and that’s how it turned out with the Albion somehow holding out during the second half onslaught from the Villagers to make up for their disappointment of losing last seasons Watson Shield final. Before a crowd of 185 under the Ampthill Town’s floodlights all of the goals were to arrive in the opening 14 minutes. With the game just four minutes old Great Barford took the lead via David Mulvihill, referee Robert Wheldon being thankful to his perfectly placed assistant Jack Giles to confirm despite the desperate attempts of the Albion defence that Mulvihill strike had indeed crossed the line ( who needs video technology when you have assistants like Jack) but their lead was to last just another four minutes before the Albion levelled. Barford goalkeeper George Ripley rushing off his line to upend the inrushing Alexis Kamenan and see referee Wheldon pointing to the penalty spot from which Craig Damon made no mistake to bring up a 1-1 scoreline. What turned out to be the winning goal was to arrive just six minutes later and again it was Damon who was the Albion goalscoring hero. Play was then held up for a good 10 minutes just prior to the half-time break when Albion’s Kamenan dislocated a shoulder, yet the crowd’s wait for play to resume after Kamenan was stretchered off was far less than that of the players wait for the called ambulance which took all of an hour to arrive. The only question many were asking at the final whistle was how did Barford not score in the second half , the answer lies somewhere between some woeful finishing, the heroics of Albion goalkeeper Luke Pell and perhaps lady luck being an Albion supporter. Stevington kept their season’s treble dreams alive when before a near 200 crowd at Shefford Town & Campton’s impressive Hitchin Road complex the Jubilee Cup was added to go alongside the already won Bedfordshire FA Junior Cup. Following a goalless first half Stevington took the lead just two minutes into the second period when Jordan Wright netted from close range but Westoning were far from out of the contest until Kieran Souter headed home goal number two just nine minutes from time. The closing moments seeing Westoning goalkeeper Tony Mcnally twice prevent Stevington adding to the scoreline, firstly with a flying save to deny Tom McGirl and then needing his legs to keep Souter at bay. The lone Premier Division supported by Sportsform action of the day saw Marston Shelton Rovers run out 4-3 home winners over Ickwell & Old Warden who will now finish the season on the bottom of the league table. Jamie Cerminara netting twice alongside Dale Makiw and Jim Burraway for the Rovers against Ickwell replies via Marko Tobzdic twice and Andrew Vallom once. It was a case of the day after the Lord Mayor’s show for both of the Centenary Cup finalists, winners Meltis Albion losing 4-3 at Marabese Ceramics in a game played on their own Miller Road pitch, the victory for the Tilermen being their first home league win of the season and with them winning the reverse fixture back in October they will end the season in having won more games at Miller Road during the campaign than at their own Ickleford base. The victory also ensured they will not end the season in the drop zone. Romano Marabese with a brace plus James Tizzard and Michael Darnell on their scoresheet against Albion replies from Asa Garlick, Dan Taylor and Craig Damon. For beaten finalists Great Barford the news was even grimmer failing to raise a side to travel to face Sundon Park Rangers thus handing the three points to the Rangers who with a point or better from their last game of the season at Marabese Ceramics on Monday will now finish the season in third spot above Henlow. Now certain of a place in the bottom two are both AFC Harlington and Bedford SA. AFC Harlington going down 6-1 at Queens Park Crescents where Shahinur Rahman with a brace plus Shazed Sattar, Daniel Rasol, Ben Griffith and Fabio Sattar were on the scorsheet for the Crescents against a lone reply from Stephen Garner. Whilst Bedford SA are now without a win from their last 14 outings after being held to a 3-3 draw at AFC Kempston Town & Bedford College Reserves who themselves have failed to win any of their last seven outings. Jonti Neal twice plus Michael Stevenson on the scoresheet for the Town against replies via Tom Marwood with a brace plus Daniel Lupton. Division Two action saw FC Houghton climb into second spot in the league standings with a 4-1 home victory over Renhold United Reserves. Sam Martin and Ali Mohiyaldeen both netting twice against a lone United reply from Michael France. Finishing the season on a high are Bedford United who made it five away wins on the bounce with a 3-0 win at Meltis Albion Reserves. Aaron Van-Home, Rory Cochrane plus an own goal marking their scoresheet. 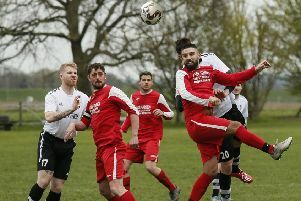 Whilst Wootton Village ended the season by losing their last five away games even though their final game a 4-2 defeat by Elstow Abbey Reserves was played on their own pitch. Dean Leydon, Shaun Cafferty, Jermayne Taylor and Andy Klein netting for the Abbey against Village replies via Sahil Hanza and Tinashe Chibanda. Enjoying better fortune on the road were Moggerhanger United, for them it was a return to winning ways for the first time in five outings with a 3-2 win at Wilstead Reserves who are still to win at home this season. Luke Rudd netting twice and Lee Adams once against home replies via Luke Prietzel and Callum Evans. Whilst Kempston Athletic were also away winners 4-1 at Marston Shelton Rovers Reserves. Sean Lawrence with a brace plus Billy Mills and Richie Andrews netting for the Athletic against a lone Rovers reply from Gary Russon. Sundon Park Rangers took their winning ways up to eight games to ensure they would finish the season in third spot by winning 5-3 at Marabese Ceramics. Joe Fallano twice and Lewis Littlechild on the Tilermen’s scoresheet against Rangers replies from Shaka Anderson with a hat-trick and a brace from Nash Bennett. The fight for the Division Two championship will now go down to the wire after Westoning avenged their Jubilee Cup defeat at the weekend with a 2-1 home win over Stevington thus ending the visitors’ 10 game winning away run. Sam Roberts and Glenn Cooksley netted the goals to take the home side to their ninth home win on the bounce, with the Stevington reply coming from Aaron Hewitt. The visitors then missing from the penalty spot just four minutes from time which if converted would have landed them the league title. Elsewhere, FC Houghton gave up their slim chance of a top two finish when they failed to raise a side to travel to Clapham Sports who were duly awarded the three points. Whilst Kempston Athletic netted win number three on the bounce with a 7-5 home victory over bottom of the table Wilstead Reserves. Sean Lawrence, Richie Andrews and Tom Knight all netting twice alongside a single strike from Nicholas Ememe against Wilstead replies via a Sam Ward hat-trick plus single goals for Luke Pursey and Hani Thiarra.